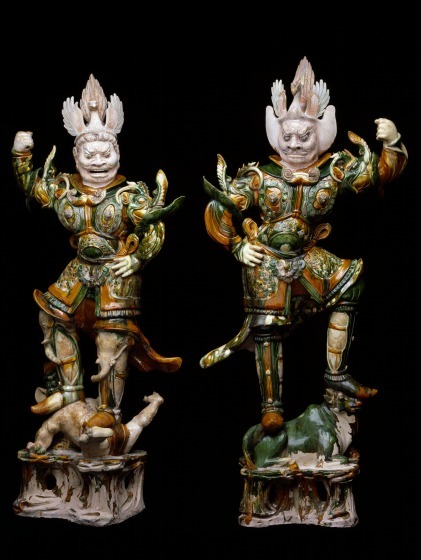 Two glazed pottery guardian figures, heavily armored, with elaborate bird-crowned headgear and ferocious facial features, stand in dynamic poses with arms raised in threatening gestures. One stands on a bull and the second tramples a demon. Scientific tests indicate that despite their near new appearance they are almost 1,300 years old. One wonders how such elaborate objects sculpted in fragile pottery could have survived so long. What are they? What was their purpose? These figures were made in the Tang dynasty (618-906 CE), one of the greatest periods in China's long history. This was the time of the Silk Road, when huge caravans crossed the deserts and mountains of Central Asia, bringing every possible type of exotic goods, animals, and people to the Tang capital at Chang'an (now Xi'an), the the world's largest and most cosmopolitan city. This dynasty ended several hundred years of disunion and chaos. The Tang aristocracy, who reunified the empire and expanded Chinese territories, were fierce warriors with a fascination for other places and cultures. Tang aristocrats maintained China's already ancient ritual and religious practices, which were centered on ancestor worship, while also mixing them with non-Chinese traditions. The Dallas Museum of Art's guardians are a direct product of that mix. During the Tang dynasty, the Chinese believed that the soul of the deceased had two principal parts, one that stayed on the earth and one that traveled to a paradise. Burial rituals were designed to provide for each part of the soul: provisions such as food and money were supplied for the journey to another world, and elaborately furnished tombs were created for the spirit's comfort on earth. The largest of these tombs were, in fact, subterranean palaces, replete with luxury goods, servants, warriors, and spiritual guardians. The main tomb chambers were at the end of a long underground ramp. Guardians were placed near the end of the ramp to protect the spirit of the deceased from evil. The size and fine quality of the Museum's guardians indicate that they were from a large and significant tomb. To provide the best protection for the deceased, these guardians represent the most powerful military figures known to the Tang Chinese, namely, the very foreigners they so often battled. While the presence of foreign warriors as guardians in Tang tombs was common, these figures also exhibit elements from another tradition: Buddhism. Powerful sculptures of exactly this type in stone and wood are found in Buddhist temples throughout Central Asia, China, and the rest of East Asia, where they served as directional guardians or heavenly kings. The tradition of stomping on demons or beasts, as seen in the Museum's guardians, is borrowed from Buddhism. Indeed, these ceramic guardians are often called lokapalas, as are the Buddhist examples. The fact that this pair is made of glazed pottery, however, indicates that they were meant for use in a tomb, not a Buddhist sanctuary. For much of its Stone Age and Bronze Age, China's aristocracy sacrificed animals and humans as part of their funerary rites. Around 300 BCE these practices began to change, and figures of wood and then clay were made as substitutes for the living. The most famous early example is the astonishing terracotta army of the first emperor of China, who died in 210 BCE. The earliest examples in clay, known in Chinese as mingqi (luminous objects), are simple low-fired painted pieces, but the active forms of the Museum's guardians are complex structures of clay built over armatures, with flowing scarves, ruffled sleeves, and decorative medallions applied to the surface. Chinese craftsmen also began using lead glazes, and by the 7th century CE their technology advanced to include a small range of colors. These glazes, now known as sancai (three color), include hues of green, amber, yellow, brown, white, and blue. Due to their expense, glazed figures, particularly large examples, were restricted to the tombs of very wealthy and important patrons. The Dallas Museum of Art's guardians exemplify a fascinating fact about tomb furnishings of the time. The earliest examples of fully developed figures with sancai glazes date to around 690 CE. In 752 CE a series of rebellions finally broke the power of the Tang hereditary aristocracy. Thus the majority of the thousands of examples of sancai sculpture that survive, and the many thousand more that are lost or still buried, were made in a period of a little over 60 years. Emily J. Sano, "Pair of Lokapala," in Dallas Museum of Art 100 Years, eds. Dorothy Kosinski, et al. (Dallas, TX: Dallas Museum of Art, 2003), 61.